“Did you not see the new Predator? 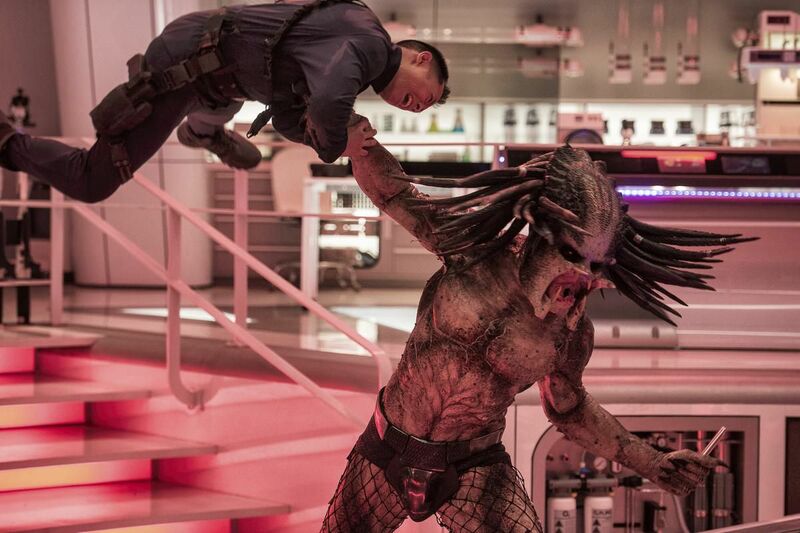 It’s evolving!” one character says to another midway through the splatterfest that is The Predator, the avowed “sequel” (really a reboot) to a sci-fi character and story that six previous movies have failed to kill. The line is an inside joke by Shane Black, the film’s director and primary screenwriter, and it’s one that all who voluntarily go to see this movie, fresh from its TIFF Midnight Madness world premiere, will get and enjoy. Black loads up his films with ironic meta-references, as seen in the likes of Iron Man 3, The Nice Guys and Kiss Kiss Bang Bang. Still as bug-faced beastly as ever, these Predator E.T.s now hunt in packs — they even have Predator dogs to help them — and they communicate with each other. Their presence on Earth is part of a plan so mwah-hah-hah diabolical, it’s almost worth applauding: global warming is steadily heating up the Earth to a temperature that’s bad for humans but great for Predators, so the invaders might as well hasten the process and extract some human spinal cords while they prepare to move in. Natch, we humans aren’t going to let this happen without a fight, but it’s debatable whether we’re sending our best into the fray. Arnold’s nowhere in sight, not even for a cameo, so we’ll have to make do with a Dirty Half Dozen of bantering psychopaths: violent ex-soldiers played with varying degrees of hilarity by Keegan-Michael Key, Trevante Rhodes (Moonlight), Thomas Jane, Alfie Allen and Augusto Aguilera. They’ll be joined, and ultimately led by, an ex-army ranger sniper named Quinn McKenna, played by Boyd Holbrook, whom we meet at the outset in a set-up filched from Cowboys & Aliens. He discovers and makes off with advanced Predator weapons and armour following a crash-landing and shootout in the Mexican jungle. He also finds himself inside a shady U.S. government research facility run by a snarly guy (Sterling K. Brown) who knows all about the Predators and their not-so-sneaky plans to take over Earth. Soon the action will shift to a generic American suburb, courtesy of Vancouver, where the film was shot. There’s not much room for women in this testosteronal tussle, but Black and co-screenwriter Fred Dekker (The Monster Squad) find a little elbow room for one: Dr. Casey Bracket (Olivia Munn), an evolutionary biologist whom we know is smart because she picks a lock with a paper clip in about two seconds flat. The movie pays big-time homage to 1980s cinema, including an action score that sounds like something Spielberg would have thrown away. And speaking of Spielberg, there’s a Spielbergian lad named Rory, played by Hollywood’s go-to kid Jacob Tremblay, who adds some precociousness to the moments in between shots and splatters. Rory is McKenna’s son, a brainiac on the autism spectrum who naturally gets involved, first as a troublemaker when he steals his dad’s Predator helmet and goes Halloween trick-or-treating in a scene that nods to E.T. Rory might have an idea or two about how to stop the Predators from treating the Earth as their new playground. My lips are sealed, except to say I preferred the Predator when he was a lot less chatty and a lot more scary.